For a while now, I’ve been wanting to switch to an XLR mic setup for GodisaGeek audio and video productions. 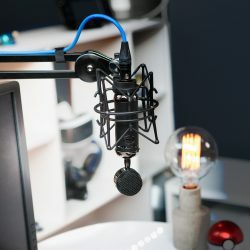 While a lot of our production is remotely done, it’s important to have the best equipment available in each setup, and while the streamer’s choice of the Blue Yeti has done me a great service, and never really let me down, the allure of moving away from USB powered audio equipment has been there for some time. In comes the Blackout Spark, then, with a small form factor, weighing far less, and offering a silent connection (often I can pick up a slight electrical buzz with the Yeti, which could be my connection, the cable, my PC – anything), even including a shock mount which means you can commit to some movement of the device when in use – but not much. Blue were kind enough to send their Icicle XLR bridge, which works as a preamp to get an XLR mic attached to a PC. What you’re doing here, essentially, is connecting an analog input to a digital interface, so there has to be some kind of bridge to facilitate that. What it amounts to, though, is an XLR cable connection one end that slots in as would any normal cable, with a mini-USB connection the other end. The Spark is an interesting bit of kit, because it’s both suitable for studio quality vocal performances (that of the chat variety, or indeed singing, or picking up acoustic instruments), but also for on-the-spot podcast recordings. This is so because it has dual mic pickups, front and back. This actually creates a slight issue for me, because the Yeti has a four way switch that allows you to shut off any sound being pick up from the “rear” part of the omnidirectional mic, whereas the Spark is more “always on”. The workaround, then, is to have the sensitivity way down (a good practice for high quality voiceover work, anyway) so that fewer keyboard or mouse clacks and clicks are picked up. On the audio quality, then, the Spark is crisp and crystal clear. While most voiceover production work is going to eventually be compressed, normalized, levelled, bass boosted, silenced, and all manner of other tricks to get the best audio, this mic doesn’t really need all of that. You might find that, to your preference, you still like to use a compressor, but using a good noise gate (digital or analog) will mean you get a very nice audio. As with any bit of high end kit, you’ll want to play around until you find the settings and setup that best work for you, and this will depend on room size, ambience, and much more. My home office is very full, so I tend to have good acoustics already, but you’ll want to lower the sensitivity and get in on the mic if you have an empty, echoey room. Regardless of how you set things up, this is one of the most consistent mics I’ve ever used. Once you’re happy with how it sounds, it just delivers. 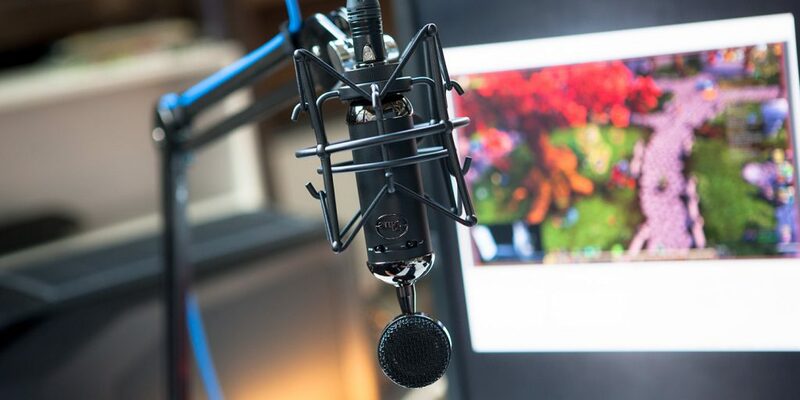 The included shock mount will eliminate some knocks and bumps, but your mileage may vary: for example, I am using a mic stand which is prone to bumps from the floor, and these are largely eliminated, but if you bang the mic, it’s still going to make noise. There are two toggle switches that can affect how you sound. For example, the -20dB switch will be useful if you are live-streaming and things are getting a bit excited. Rather than blowing your listeners ears out, the switch will just cut it accordingly. The other switch is a 100Hz high-pass filter, which, use-case wise, is likely to be for those who have high ambience. Blue suggest using it if you’ve got rumble, likely coming from a loud desktop PC, etc, and in practice, it does exactly this. Ideally, though, you won’t need these filters unless you’ve not set up right in the first place. In conjunction with a good preamp, you’re not going to need another microphone for a long time. Short of spending a lot more money, the Blackout Spark is a terrific purchase for those fairly serious about home recording. If you’re just recording a podcast with your friends that a few people share around, maybe go for a lower end device, but if you want to sound your best for the money, this is a fine, fine choice.